The FOBM was delighted to hear about the visit of HMA Jon Wilks to the Basrah Museum. 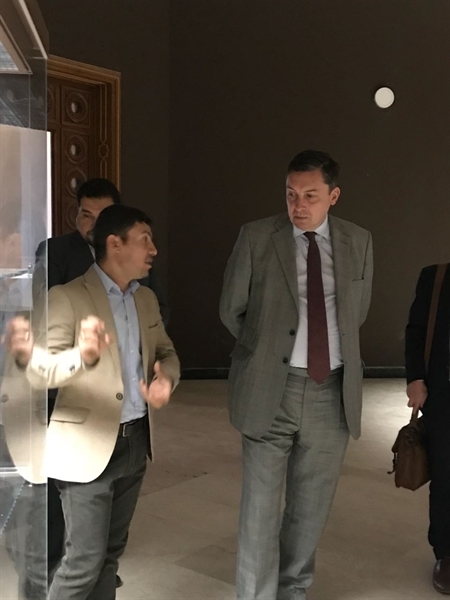 Museum Director Qahtan Al Abeed provided an explanation of the Basrah Gallery objects and ths history of the Museum to the Ambassador, his colleagues and entourage. Photos were provided by Qahtan Al Abeed and Mahdi Al Musawi. The FOBM Trustees are grateful to a number of people and companies for ensuring that the Reier Museum Display cases designed for the three remaining galleries were delivered in March 2018 to the Basrah Museum. Two members of the Basrah Museum Staff attended special training sessions on the cases at the Reier factory in Germany. FOBM is grateful to Reier for manufacturing the cases within the critical time scale of the CPF grant and ensuring their timely delivery to Umm Qasr Port. 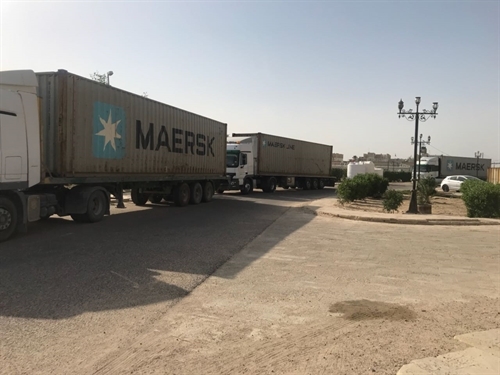 The four containers were cleared through the port through the assistance of Mahdi Al Musawi of Bur Alaman and Sea Jewel and Peter Hunt and Sarah Cain of HWH & Associates with the involvement of Qahtan Al Abeed, Basrah Museum Director, and no doubt with the assistance of many others. The cases are being unpacked and placed in the galleries. 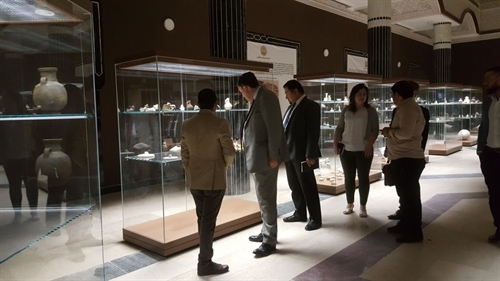 The next phase includes the on-going selection of objects with a joint committee of the State Board of Antiquties and Heritage and the Iraq Museum with the Basrah Museum with the close involvement of HE Qais Al Rasheed, Vice-Minister & Chairman of the State Board of Antiquities & Heritage and Director of the Iraq Museum. 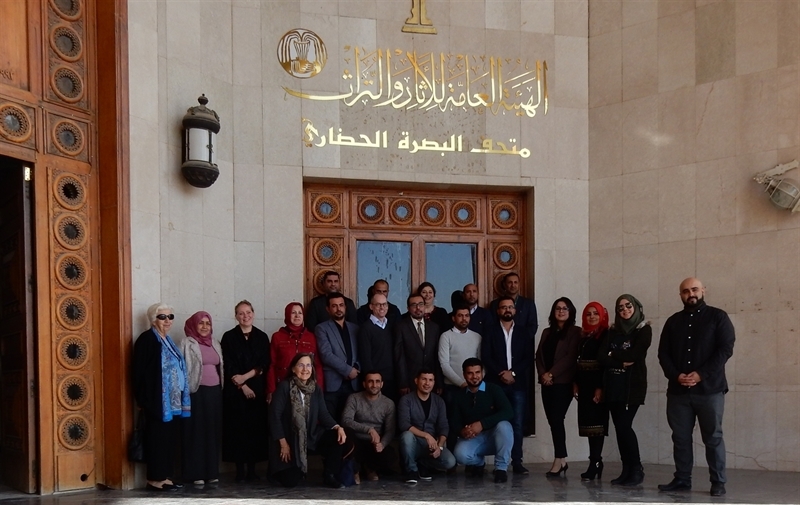 The Friends of Basrah Museum's Report on the training programme delivered by Dr Paul Collins, Dr Noorah Al-Gailani, Dr Ulrike Al-Khamis and Dr Lamia al Gailani-Werr with support from Joan Porter MacIver (organiser and report author) and Ali Khadr (volunteer and programme evaluator) is available here. Dr. Paul Collins, Jaleh Hearn Curator of Ancient Near East, Department of Antiquities at the Ashmolean Museum, University of Oxford. The Friends of Basrah Museum will be introduced by Mrs Joan Porter MacIver, CPF Grant UK Project Co-ordinator. With the support of the London based charity, Friends of Basrah Museum, and a grant from the Cultural Protection Fund, a former palace of Saddam Hussein has been restored as the new Basrah Museum. After 8 years of work, the first of three gallery spaces was officially opened in September 2016. This lecture will explore the on-going work at the Museum and how the institution will play a significant role in helping to foster sustainable development of antiquity, cultural heritage and the humanities in the post-conflict Middle East. Paul Collins is Jaleh Hearn Curator of the Ancient Near East in the Department of Antiquities at the Ashmolean Museum, University of Oxford, and voluntary Chair of the British Institute for the Study of Iraq (BISI). He has worked previously as a curator in the Middle East Department of the British Museum and the Ancient Near Eastern Art Department of the Metropolitan Museum of Art, New York. A Flyer for this lecture can be found here. Please confirm your attendance to info@mbifoundation.com - places are limited and reservations are required. The Friends of Basrah Museum organised and delivered a six day basic Museum Management Training course in January 2018. The Trainers were Dr Paul Collins (Ashmolean Museum, Oxford & BISI Chairman), Dr Noorah Al-Gailani (GlasgowLife / Glasgow Museums - Burrell Collection, Glasgow), Dr Ulrike Al Khamis (Aga Khan Museum, Toronto) and Dr Lamia Al-Gailani Werr, FOBM Trustee. The Trustees thank these supporting museums for enabling their museum professionals to take part in the intensive training week. The programme was organised by Joan Porter MacIver (Friends of Basrah Museum) and Ali Khadr (Volunteer & BISI Executive Officer). The Programme can be viewed here. The support of the Qahtan Alabeed, the Museum Director and Director of Basrah Antiquities & Heritage, and also from Mr Mahdi Al Musawi, Museum Volunteer and of Bur Alaman Company, was invaluable to the smooth running of the programme. The FOBM Trustees thank HE Qais Al Rasheed, Chairman of the State Board of Antiquities and Heritage, for his support and assistance with the training programme. Sixteen participants took part – seven Basrah Museum staff members, three Museum volunteers and six SBAH employees from Samawa, Nasariya, Maisan and Baghdad. The FOBM is planning further training opportunities for the Basrah Museum staff in the final year of its CPF grant. More information on the programme can be found here in the Report & Evaluation. There are images from the training programme in the Image Gallery. (Left to Right) Back row – Sarmad Saleem (Basrah Museum), Fadhil Abdel Abbas (Basrah Museum), Dr Noorah Al-Gailani (Trainer/Glasgow Museums), Haitham Muhsen Sfoog (Baghdad – previously Basrah) and Magid Kassim Kadhim (Basrah Museum); Middle Row – Dr Lamia al Gailani-Werr (FOBM Trustee), Siham Giwad Kadhun (Director Maisan Museum), Dr Ulrike Al-Khamis (Trainer & Aga Khan Museum), Iqbal Kadhim Ajeel (Director Nasiriya Museum), Sufian Muhsen (Head of Governates’ Museum Department, Iraq Museum), Dr Paul Collins (Trainer/Ashmolean Museum), Dr Adil Kassim Sassim (Head of the Natural History Museum, Basrah, & Univ. of Basrah), Wissam Abd Ali Abdul Hussain (Basrah Museum), Sawlan Adnan Alahmar (Samawa Museum), Tamara Alattiyeh (Museum Volunteer and Saraji Palace Museum Project coordinator designate), Sakna Jaber Abdel Latif (Museum Volunteer), Ayat Fadhil Sadkan (Museum Volunteer) and Ali Khadr (Evaluation Report & BISI); Front row kneeling: Joan Porter MacIver (FOBM), Abdel Razak Khadim (Basrah Museum), Qahtan Al Abeed (Basrah Museum Director) and, Salah Rahi (Samawa Museum).